This simple sauce brings a creamy freshness to almost any dish. 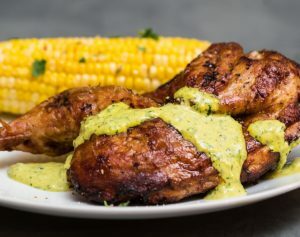 I call it my “Peruvian Chicken sauce,” as it goes exceptionally well with my Smoked Chicken “Peruvian Style.” This sauce goes well with just about any simply grilled fish or meat, so feel free to pour it on! This sauce uses Aji Amarillo paste, which has a great flavor, but can carry a late heat, similar to cayenne pepper. If you don’t have any, substitute a tablespoon of pureed chipotles in adobe sauce, or a sprinkle a bit more of the cayenne if you’re not in the prepping mood. 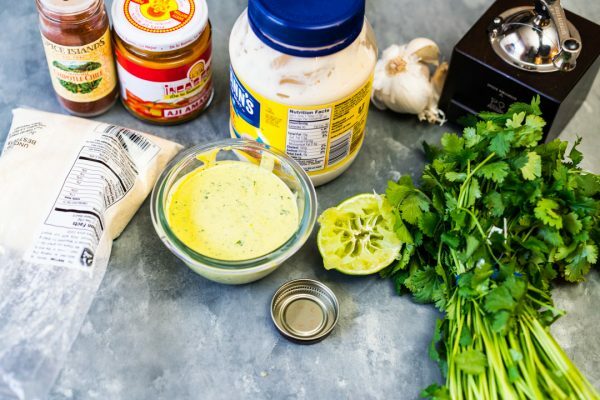 This creamy sauce adds a freshness to almost any grilled meat or fish. Add all ingredients to a food processor or blender. Pulse to incorporate. While blender is running, drizzle in olive oil. Scrape from blender and refrigerate.